Japanese treats Korea as his own and it was greatly prospered under Japan reign. Many people misunderstand this, but Japan actually did not colonize Korea. At least there is no such history of exploiting or controlling this country for the sake of its own benefit without any reason, just like other Western nations did. Correctly it is annexation where Japan treated Korea in the same way as Japan. Korea was a Tributary state depending on China for hundreds of years. There was no currency economy was not developed enough, and the domestic industries were scarce. This photo is a photo of Namdaemun in the center of Seoul today. 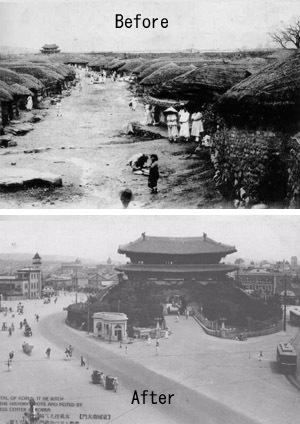 In those days in Seoul, there had not existed 2 story houses. Isabella Bird, English woman who traveled in Korea in 1894, described Korea as terribly unsanitary and one of the most poor quality in the world. The ruling class in those days used Chinese characters a lot and they would despise the sentences written only in Hankul as the letters of the lower class. After Japan ruled Korea, Hankul was taught in the educational policy formulated by Japan, and through that Hankul has diffused. Until that time in Korea, there was no such concept of ‘Shi’(氏) – groups of families. There was only ‘Sei’(姓), which shows blood relations. Therefore Japan decided to give ‘Shi’ to show the groups of families. It is often misunderstood but it was not forced but the Koreans were able to make choices. They were not robbed of ‘Sei’ which was Korean tradition. Maintaining the ‘Sei’ to show blood relations, they were given choices to add ‘Shi’ to show the connection of families. In fact, among the Koreans who live in Japan, some have become a diet member of Japan, maintaining a Korean ‘Sei’. In addition, they were also able to use Japanese names This was done especially as a request from those Koreans who lived in Manchuria, because Koreans were discriminated by Manchurians and Chinese in Mancuria. Therefore, many Koreans desired to change their names in order to avoid the persecution. To protect Koreans from discrimination was in accordance with the Japanese ideal of ‘Greater East Asia Co-Prosperity Sphere’. That is why this type of policy was introduced.